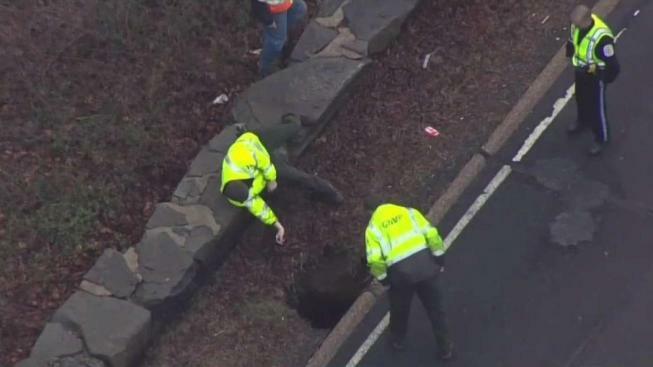 The northbound lanes of the George Washington Memorial Parkway in Fairfax County, Virginia, were expected to reopen about 2 p.m. Saturday after a sinkhole opened up during the Friday morning commute. The lanes were closed between Interstate 495 and Route 123 (Chain Bridge Road), according to the National Park Service, which maintains the parkway. Officials previously believed that the lanes would be closed through the weekend, but the work was finished sooner than anticipated. The 10-foot-deep sinkhole was discovered just before 6 a.m. Friday when a car traveling north hit the sinkhole next to the road. That driver apparently lost control of their car, hitting a stone wall before pulling over on the side of the parkway. First responders then arrived on the scene and found the sinkhole under the road, the NPS said. The sinkhole opened below the road near the Dead Run creek, likely because a storm water pipe opened deep underground, an NPS spokesperson said. 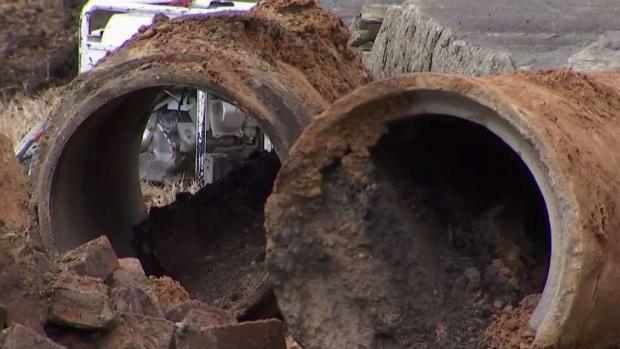 Authorities didn't detail if the sinkhole is related to the soaking rainstorm that dumped upward of 2 inches of rain on the D.C. area. Road crews and engineers spent Friday assessing the damage to the road and worked overnight to repair the massive sinkhole, which was 12 feet wide and 30 feet long. Crews refilled the sinkhole with more than 350 square feet of new asphalt Saturday. The NPS will monitor the area for settling and will repair the median in coming weeks, a release said. Drivers should expect single-lane, night-time closures to allow for the work to be done.